33-21-5, 4th place Atlantic division, 6th in the Eastern conference. The real teams in the Atlantic run bartertown once again. 38-14-5, 1st and 1st. what the hell is going on. did you know Jordan and Marc Staal are brothers? Last edited by Kaizer on Tue Feb 21, 2012 6:39 pm, edited 3 times in total. What ever happened to Wolski? Seems hard to believe he scored 23 goals and 65 points just a few years ago. columbia wrote: Rangers as Totenkopf? he is referring to the picture of the SS camp Kommandant from Schindler's List. 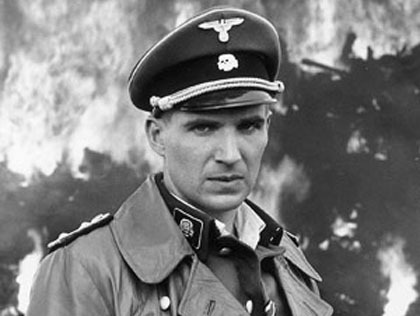 jesus christ, lundqvist looks a little bit like ralph fiennes in schindlers list. its not some rubiks cube album cover from the beatles. Kaizer wrote: jesus christ, lundqvist looks a little bit like ralph fiennes in schindlers list. its not some rubiks cube album cover from the beatles. What's the over/under on Tangradi minutes tonight? Rubik's cube album cover from the Beatles sounds intriguing, though. NashvilleCat wrote: What's the over/under on Tangradi minutes tonight? Ehhhhh.....a little creepy stuff between Dupuis and Cooke there. Do we really scratch Jeffrey in favor of Tangradi? Scouts from Tampa, Columbus and ?? in the building. They mentioned the three in the pregame but I can't remember the 3rd. Gaucho wrote: Do we really scratch Jeffrey in favor of Tangradi? That is odd. There has to be a reason beyond ability.